The “Y2K” threat was everywhere. Warnings were on TV, radio, and the internet. No one knew exactly what would happen when the clocks hit midnight on December 31st, 1999. Just think, JK Rawling had just published her fourth Harry Potter book and reading was on an upswing. That’s the time frame that ushered in the first edition of Strategies That Work by Stephanie Harvey and Anne Goudvis and I remember it vividly. This year, 2017, heralded the top-selling third edition of their book and what we now know as basically a 20 year decline of teen reading. 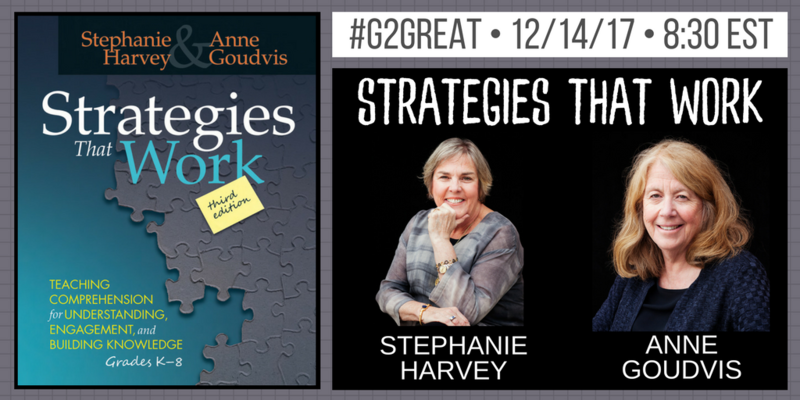 With a focus still on students and engagement, we were excited to have Stephanie and Anne join us for the #G2Great chat on Thursday, December 14, 2017! 1) How do students “understand” the texts they work with? Students need to be thinking first and foremost. Stephanie began and ended the chat with comments about the role of the students in this work. Every time a student is reading, the student needs to be thinking. In fact, when “thinking falters”, students need to be able to independently reconnect with text. In the words of Stephanie and Anne, we need students to be “thinking intensive readers, listeners and viewers.” How do we know what students are thinking? 2) How do we increase student engagement with texts? One way we increase engagement with text is to add in more student choice in what is read in our classrooms. High quality texts also need to be available to students in large quantities across the day. A second way to increase engagement is to pay attention to our assessments. What is your metaphor for assessment? Is assessment a mirror, a window, a door? Can it be all of these at varying points in the instructional cycle? An assessment is a mirror when it reflects the student learning. It can be a window because it allows two different views: the reflection like a mirror as well as an opportunity to look through the glass and see what is happening. And yet assessment can also be the door that opens into the next phase of learning. When our goal is to have independent readers, who can and do read, who read strategically, and who think when reading, we often ask our students to self-reflect on their learning. If we ask students to self-reflect, doesn’t that seem to imply that teachers would be reflecting DAILY on the relationship between student learning and the instruction provided? 3) How do we increase and build knowledge? Teachers have been working with students to leave “tracks of their thinking” with post its, annotations, and other tools. But are students using these tracks independently or using them on teacher demand? I have been fascinated for three years by Stephanie Harvey’s claim that school days would function well with four workshop periods: “Reading, Writing, Math, and Research (science/social studies). Because of the workshop format, students would be expected to be reading, writing, thinking, talking, making, and learning across the entire day. 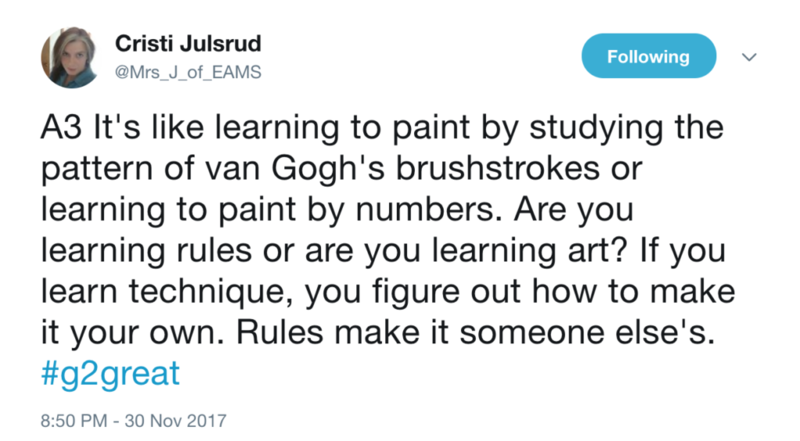 Is that the learning you want for your students? Is that the learning your students need? Which answer will best meet the needs of your students? Three editions: Why were those necessary? Check your shelves because you may have earlier copies of Strategies that Work. Or someone in your building may have them. Earlier editions are never “wrong”; typically more work and thinking has resulted in clarifications and additions that strengthen the original ideas. Sometimes misconceptions about implementation issues are also clarified. Strategies that Work has remained the title over the 17 years of the published life of this text; it’s the subtitle that has changed as reading pedagogy and research has evolved in the early decades of the 21st century. 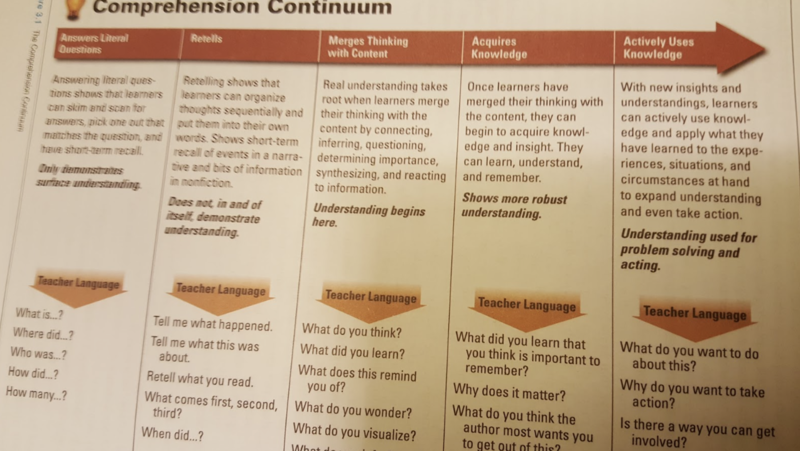 In 2000, this work began as Strategies that Work: Teaching Comprehension to Enhance Understanding. Neither Stephanie Harvey or Anne Goudvis claimed to be “researchers” but they built their text on the comprehension research in the field of literacy. The second edition title moved to Strategies that Work: Teaching Comprehension for Understanding and Engagement just five years after the authorization of No Child Left Behind (NCLB). Punitive measures were already in place for “failing schools” and Stephanie Harvey and Anne Goudvis wanted to ensure that engagement became a factor. But unfortunately, the comprehension work did not meet the “Scientifically-Based Reading Research” definition under Reading First so many primary teachers worked from a narrower list of explicit comprehension strategies. Talk and actions involving Common Core State Standards began to swirl across the country in 2008 thanks to the National Governors Association and then 2015 brought the Every Student Succeeds Act (ESSA) as the first legislative overhaul of the Elementary and Secondary Act in over 30 years. Both of those actions have impacted literacy instruction. In 2017, this third edition is titled Strategies that Work: Teaching Comprehension for Understanding, Engagement, and Building Knowledge, Grades K-8 and is perfect for teachers new to teaching or those who need to consider which current practices need to be continued and which need to go! Do you need the 3rd Edition? Stop for just a minute. Here’s one way to think about it. Consider your answer to these next two questions. Were you in a classroom during the 2000 – 2017 era? Did you notice any changes in comprehension instruction? (As a teacher, student, or both) If not, please keep reading. If yes, please keep reading. What changed from Edition 1 to Edition 2? What changed from Edition 2 to Edition 3? Based on these descriptors, you might consider comparing the different versions with a friend and checking out “close reading, close listening, text complexity, critical thinking, and thinking-intensive reading and learning as a starting point. What’s the end goal for students? For “…students to become engaged, thoughtful, independent readers.” Are your students engaged, thoughtful, independent readers? Or are they just going through the motions with a bit of ‘fake reading” thrown in? What is your plan to ensure that ALL of your students are engaged, thoughtful, independent readers? If not this work, then what other professional development resources should you consider? When will you begin? How will you know that your changes are providing your students with opportunities to increase their comprehension, engagement and to build knowledge? Harvey and Goudvis. 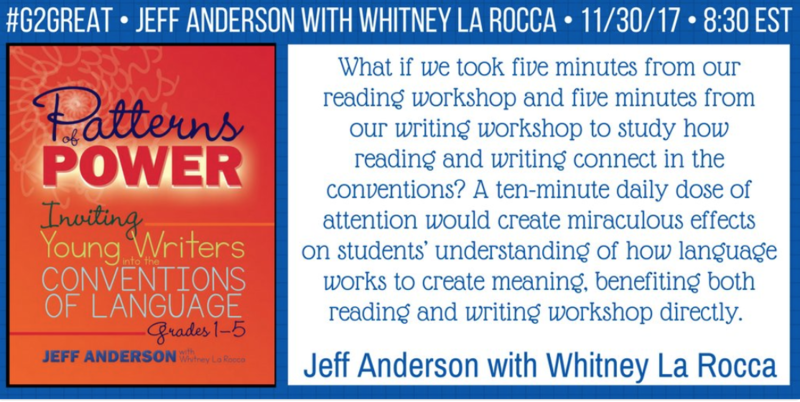 Strategies that Work: Teaching Comprehension to Enhance Understanding. Stenhouse, 2000. Harvey and Goudvis, 2nd ed. Strategies that Work: Teaching Comprehension for Understanding and Engagement. Stenhouse, 2007. Harvey and Goudvis, 3rd ed. Strategies that Work: Teaching Comprehension for Understanding, Engagement and Building Knowledge K-8. Stenhouse, 2017. On December 7, 2017, old friends honored us with a return visit to the #G2great guest host chair. 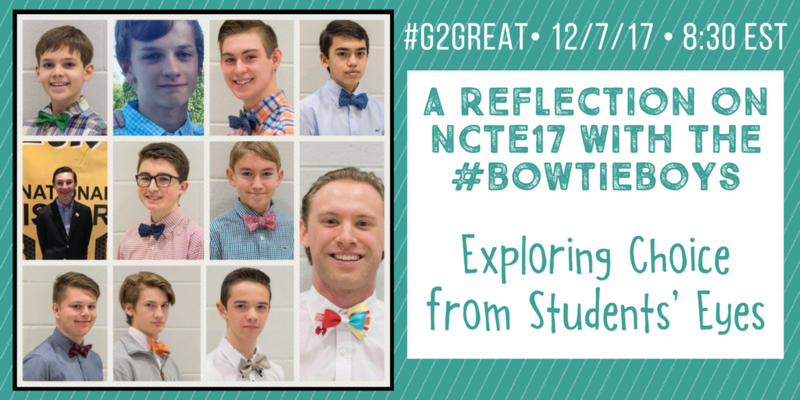 #BowTieBoys with teacher Jason Augustowski have joined us on three other occasions including May 25, 2017, March 16, 2017 and June 9, 2016 (our first guest #BowTieBoy, Sam Fremin). This week we were excited to celebrate NCTE17 as we explored Student Choice from their very wise eyes. 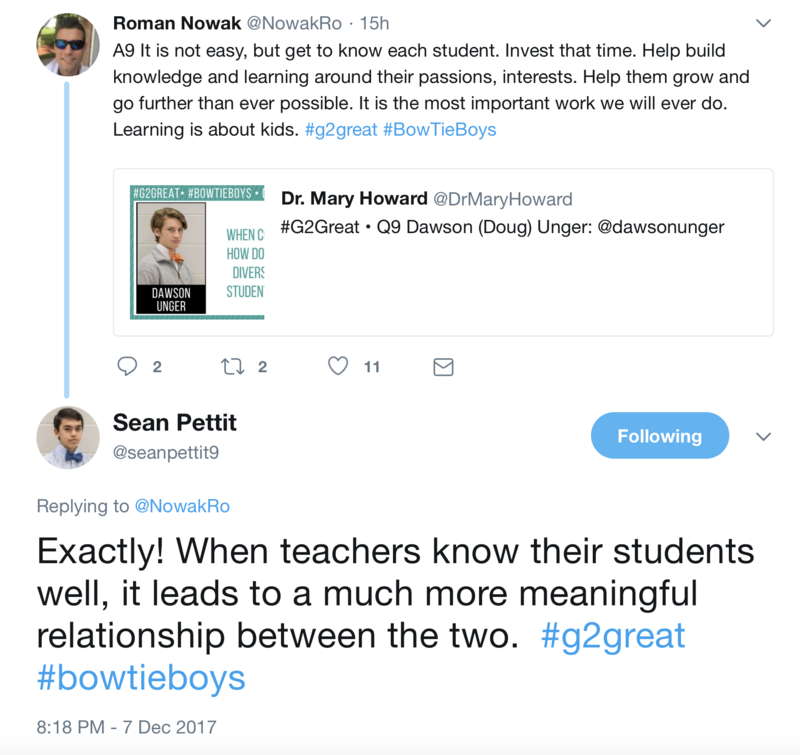 I consider myself the self appointed #BowTieBoy cheerleader – or as Lester Laminack lovingly dubbed me on facebook: “official Fairy Godmother of the #BowTieBoys.” The pleasure is all mine! I first met #BowTieBoys when I saw them present at NCTE 2015 and was instantly professionally smitten. I was grateful to join their #NCTE 2017 presentation and watched with pride as they rotated from table to table sharing their collective commitment to student choice. These young men in high school possess wisdom far beyond their years and have the uncanny ability to translate that wisdom in ways that could maximize our instructional efforts if we are only willing to listen to their oh so sage advice. 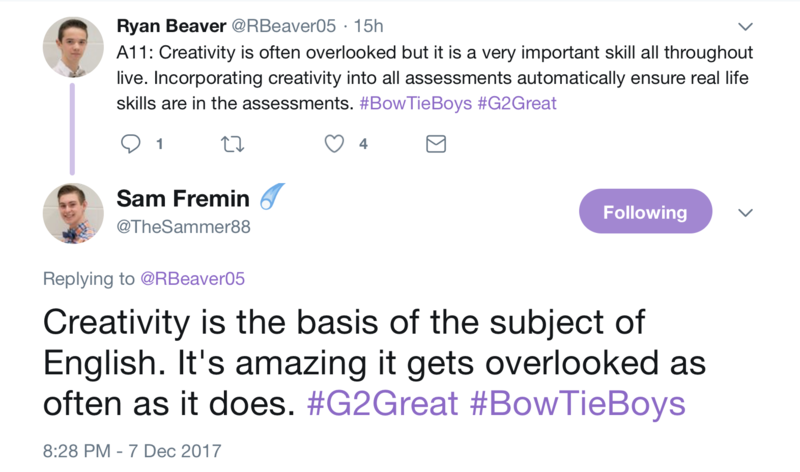 It is worth emphasizing that each of our #G2Great questions was posed by #BowTieBoys based on their interests and that they literally took over the #G2Great chat reins just as they have each time they visit. One of the first things I noticed as I looked back across the chat was the repeated use of the words trust and relationship. In fact, the very spirit of the chat was grounded in a deep respect for both the learning and teaching process. Jason, Sam and Ryan H help us see those ideas from both sides and how relationships or the lack of them can either impede learning or help students to “flourish.” Learning depends on our willingness to build this foundation of positive relationships between students and teachers from the first day of school. But this is only possible when we know our learners enough to craft the instructional experiences that demonstrate that we have their best interest as learners at heart. Another common discussion point that was interwoven across all questions was the importance of creating a classroom design that could support and nurture choice. Jason and Christian remind us that this is a shared process that engages student and teacher as design partners (which reiterates the spirit of respect in the first point). Kellen added to this conversation by emphasizing that this can prove challenging for students who may not have previously experienced a flexible design mindset. We could at least in part address this concern by giving students a shared role in this process while recognizing that some students may need additional support along the way. Perhaps the question that elicited the greatest range of varied view was the one that asked us to consider if it is possible to have too much choice. Ryan B and Ryan H reflect this variety since Ryan B felt that this is largely dependent upon individual students while Ryan H felt that choice should be a component of every learning experience. One of the things I particularly appreciate about these varying viewpoints is that both agreed that they personally needed no boundaries even though there was variation in what they feel other students may need. What struck me about these distinctive perspectives is that it illustrates why we need to know students and then make these decisions accordingly. 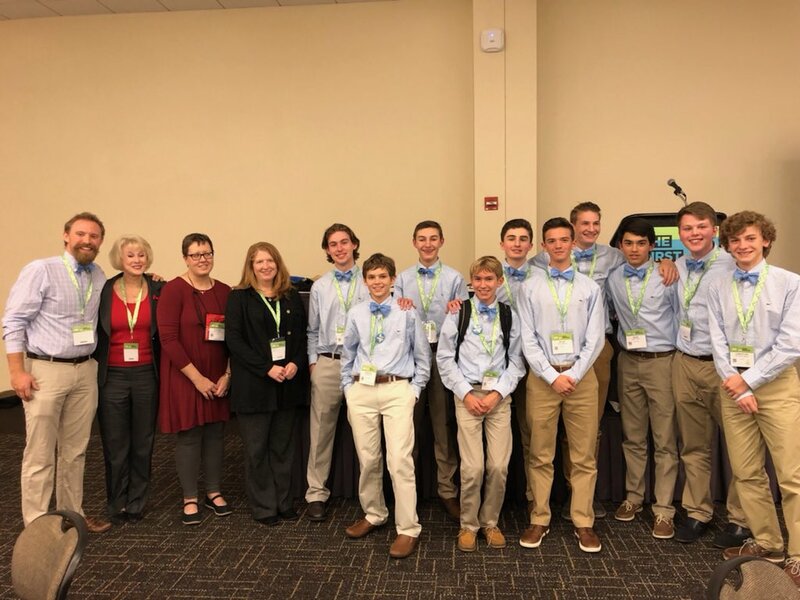 Jack, Sam and Sean noted the value of creating an instructional experience that will help learners move beyond our four walls as we expand our horizon by embracing real world concerns and issues. While there are certainly professional constraints that we must adhere to, this does not mean that any teacher is forced to turn a blind eye to the very issues that students will be facing in their own lives once they leave those walls. This is not a either-or proposition but an issue of refusing to allow obligations to cloud our view of responsibility to our learners. It can also reflect a two pronged issue since it requires teachers and students to explore topics that may even be uncomfortable while maintaining enough choice for students to navigate those topics in creative ways. When we discuss choice within the instructional process it will inevitable require us to consider where meaningful dialogue with peers can fits into this process. Any time we reflect on empowering our learners within the learning process we must also consider how we will create an instructional framework where student talk is at the center of that process. Ryan B and Sean remind us that choice also plays a role in the collaborative process as we can offer different ways for students to collaborate based both on the partnerships as well as the structure of those partnerships. It is important to consider distinctive possibilities including partners and small groups and to ensure that these partnerships change over time. As we acknowledge the important role that choice can play in an engaging instructional environment, we must also examine how we will help students assume increasing responsibility for this role and what this could look like in an instructional setting. This is not simply a matter of the teacher saying, “I’m going to offer choice” but considering choice in much deeper ways. This will require us to maintain the flexibility that will leave room to support students in a variety of ways as we put choice into action and likely make adjustments as we make choice a priority. Christian and Spencer explore both sides of this issue by highlighting this supportive process as well as allowing for that flexibility within those choices. It would be challenging to even consider the role of choice without considering where this fits from an assessment perspective so I was grateful this question was addressed. Doug emphasized that choice can be connected to the assessment process as we allow students to show what they have learned in a unique ways. Spencer tackled a common concern teachers express about the challenge of applying grades to authentic learning by suggesting that we shift our perception. If we started with the authentic task that we want to celebrate, then we could design assessments around this lofty end goal as a logical way to ensure that both are in place. It seems to me that joyful engagement is the undergirder of the entire discussion about choice. Incorporating student choice is not merely done for the sake of choice but to consider the implications of this decision. By making choice a priority, we are acknowledging that there is no virtue to merely asking students to sit at a table to be filled with information. Choice reflects our commitment to learning opportunities that actively and pleasurably engage our students with their own learning. Doug, Jack, and Kellen illustrate why incorporating choice is so relevant in that we want to create instructional experiences where students are active participants in productive learning that will also take their unique needs and interests into consideration. Engagement and joy go hand in hand as one has the potential to dramatically impact the other for better or worse. Quite frankly, we need both. 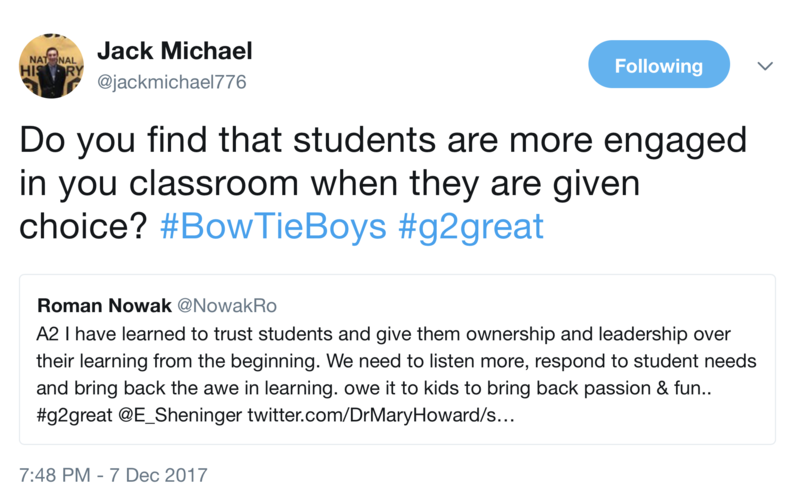 #BowTieBoys have given each of us who are lucky enough to learn from them such an incredible gift and it is my hope that we will open this discussion to students in classrooms across the country. Their passion for learning and willingness to share their thinking offers us a lens to see our teaching from their eyes. We have long known that choice can play a powerful role in the learning process and yet this role is largely ignored in too many classrooms. They remind us that student choice is not just a topic to be discussed but an issue that must also consider the human factor as we envision what this means for our own learners. We are so honored that they invited us all into their world through their generous sharing and graced the #G2Great stage once again. Imagine if you will a classroom where we break free of the box that is confining teachers and students from exploring opportunities that abound. Imagine what would be possible if we were willing to gaze through a two-way reflective mirror and see the instructional process not only through our own eyes but through the eyes of our students. See #BowTieBoys engaging in the Twitter Chat they led! 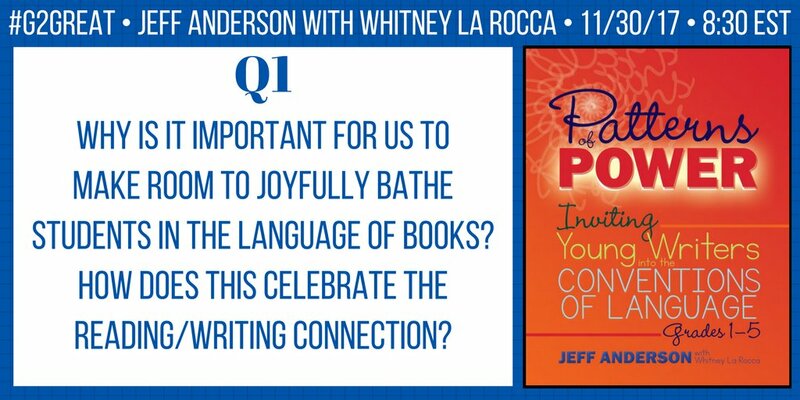 On Thursday, November 30, 20017 Jeff Anderson and Whitney LaRocca joined #G2Great and began a much needed conversation about how to integrate powerful instruction for the conventions of language. This is a topic of great importance to teachers everywhere, as we are keenly aware that we need to find ways to make grammar instruction meaningful and relevant to students. When students understand grammar as a craft move they will unlock greater meaning and skill as readers and writers. 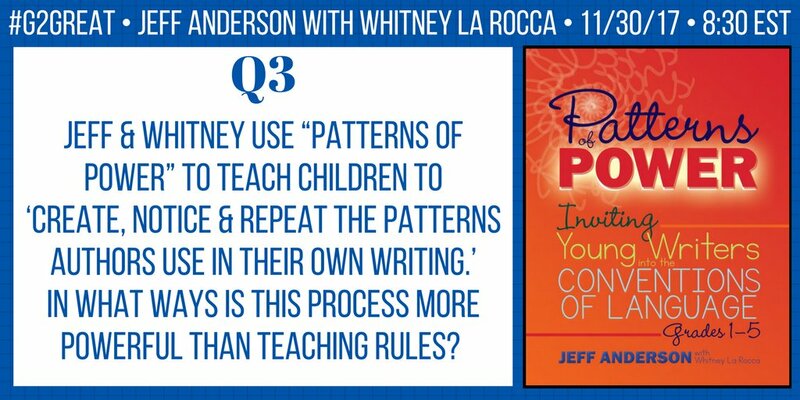 Thank you, Jeff and Whitney your book, Patterns of Power Inviting Young Writers Into the Conventions of Language Grades 1 – 5 is the kind of book that pushes teachers to move from good to great classroom instruction. You remind us to think about how to connect students’ reading and writing lives in purposeful meaningful ways to strengthen their understanding of both.